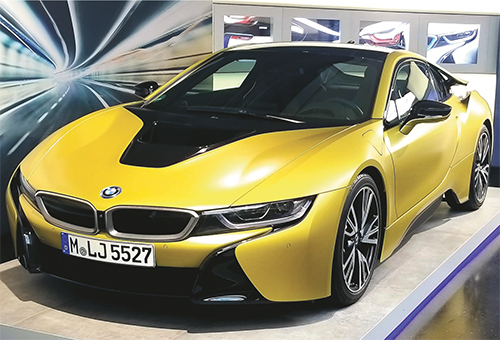 BMW employs various testing methods to ensure formability of materials to meet challenging auto-panel designs, as shown in this exhibit at BMW World at the carmaker’s headquarters in Munich, Germany. Mid-October provided the opportunity to take an up-close look at sheetmetal testing products and applications. ZwickRoell, Ulm, Germany, invited MetalForming to its testXpo: 27th International Forum for Materials Testing. The ZwickRoell Group includes companies specializing in various areas of materials and components testing. That includes ZwickRoell in North America, Kennesaw, GA. Focusing on growing its U.S. market, ZwickRoell used testXpo to announce that it has found a new Kennesaw location to build ZwickRoell’s new North American headquarters, a facility slated for completion in 2020. The company’s headquarters in Germany, with about 1100 employees, includes automotive and metals competence centers. The centers house various sheetmetal-testing equipment for use by primary metals producers, service centers and metalformers as well as their end-use customers such as automotive, aerospace and medical OEMs. We saw these machines in action, used for resistance, force and displacement as well as other measurements. Recognizing the lean-and-mean nature of the North American sheetmetal-forming and fabricating industries, Roell stresses the need for professionals in these industries to know the limits of their materials. 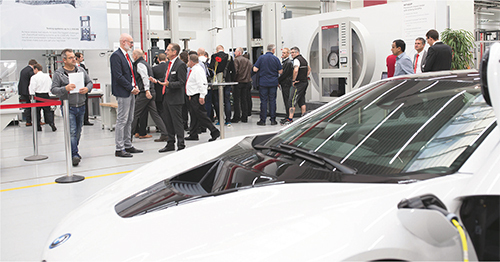 MetalForming viewed various testing machines and applications during ZwickRoell’s testXpo at its headquarters in Ulm, Germany, this past fall. “Those producing parts from sheetmetal push materials to their limits, and testing machines enable such companies to double-check simulations and real-life results,” he explains. Through tours and presentations, we learned of various organizations employing testing apparatus to ensure ideal sheetmetal performance during and after forming. For example, Voestalpine produces sheetmetal specimens to test surface waviness per a Volkswagen standard for autobody panels. Specimens are tested specifically for long waviness, a condition that does not reveal itself on formed components until they are painted—by this point, corrections result in excessive scrap and time costs. 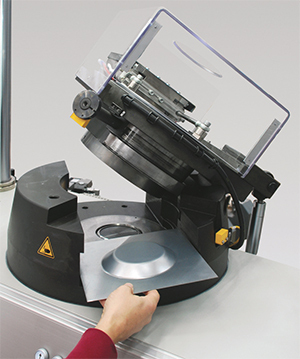 A 600-kN static materials-testing machine along with a deep-draw-test fixture, both supplied by ZwickRoell, are used for cupping tests on these specimens. A special feature of the testing system: a laserXtens extensometer with eight measurement axes. It measures surface strain without making contact with the test material and stops forming at a set value. With this capability, specimens need not be premarked, thus saving preparation time. Voestalpine is the first user of this technology package and, should testing demand increase, it can be expanded to include an automatic specimen-feeding system. Here, a specimen is tested to help determine sheetmetal drawability. The machine shown is employed for cupping and earing tests to examine sheetmetal ductility and investigate the influence of surface treatments, coatings and lubricants in typical forming applications. As new steels approach and surpass tensile strengths of 2000 MPa at relatively low elongation levels (less than 10 percent), apparatus must be designed to provide all-important material testing and quality assurance. Another need for uniquely designed test equipment is the rise in hot-stamping work for automotive. Mechanical tests often applied for hot stamping include tensile and bending tests as well as high-speed tests related to crash simulation and to measure high strain rates. Challenges abound in testing hot-stamped components, ZwickRoell’s Bob Donohue, regional sales manager, explains to MetalForming. A current issue in automotive hot-stamping applications is process optimization, he reports, and optimization revolves around austenitizing and hardening that result from the heating and cooling inherent in the process. Key to optimization is the ability to determine material properties surrounding these stages. Actions may involve warm tests such as tensile and compression, and tensile tests performed on small specimens at room temperature. Why small specimens? Contoured hot-stamped parts often produce little space in key areas where ideal testing samples can be cut. Such small, yet hard test specimens do not lend themselves to traditional gripping solutions for tensile tests and, thus, require innovative methods. For example, Donohue offers, ZwickRoell has patented hydraulic grips for short clamping lengths—needed to grip smaller specimens during testing. These grips enable testing of specimens with shoulder lengths as short as 6 mm as compared to lengths that typically measure at least 40 mm. Along with horizontal gripping force provided by two horizontally placed actuators, a third actuator provides vertical force for stabilization. Besides allowing for shorter gripping lengths and smaller specimens, the hydraulic grips present no visual or physical obstructions when employing optical or mechanical extensometers. Our tour also included demonstrations of machines used for tests to examine sheetmetal ductility and investigate the influence of surface treatments, coatings and lubricants in typical forming applications. For its part, ZwickRoell provides its BUP series of machines for these purposes, available in various force ranges. Typical test methods include Erichsen cupping tests, in which a hemispherical punch is pressed into a clamped test piece until a crack appears. The clamping ensures no inflow of material toward the stressed area of the test piece. The drawing formability of the sheetmetal is determined from the punch-penetration depth. With another test method, the earing test, circular blanks are punched, or inserted and drawn into cups. Here, material is allowed to inflow, and the deep-drawing characteristics of the sheetmetal are determined via an ear/height percentage ratio. Also employed via these machines: square-cup, hole-expansion, FLC and bulge tests.